Survey Says…They all look alike. In the last installment of Five Frames, One Face, One Vote , the people spoke. And while the favored frame was Zaag (far right photo), no one seem really thrilled about the plastic placeholders I modeled all too eagerly. Your honesty was refreshing (if not jarring), but I’m a big boy; I can take it. In the end, most folks liked my current frames, the ones with the wad of gorilla glue at the bridge. I always listen to my inner voice(s), and yes the cinnamon roll was delicious. I was off to our island True Value to seek help from the resident sages of hardware wisdom. After a close inspection of my glasses by an impromptu handyman conclave, consensus was reached. Apparently not all super glues and epoxies are alike, especially where plastic is concerned. 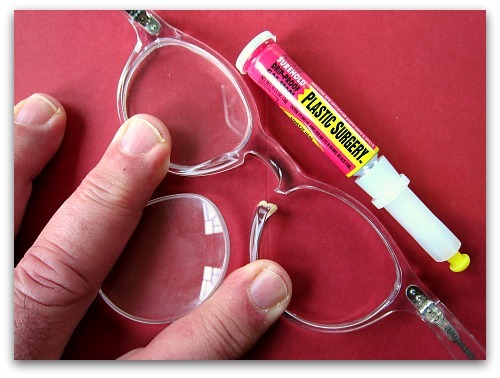 I was told acetate glasses needed a glue formulated to hold plastics, and so I made my purchase; one tube of Plastic Surgery, please. In my junk drawer (actually they’re all junk drawers) I found some old plastic toothpicks and used them to apply light dabs of glue between lens and frame. Trying to keep the glue off the lenses was the biggest challenge along with pressing the frame together for the allotted drying time. Minutes later, frame and face were reunited. I can see clearly now and it cost me all of $2.99. Plastic Surgery worked beautifully and everything old is new again. I can see, I can see! Oh and for those who ventured off the track and shared their impressions of my foray into facial hair (i.e. lose the beard), I shall take your insightful opinions under consideration. In the meantime, I did trim my beard. It’s a start. And again, thanks for your help everyone; survey says…you’re AWESOME! P.S.I would go spend all that money you saved at your favorite nursery. NAH Tom, the beard should stay. It looks fabbo even before a trim and style :-). I like the repaired glasses much, much better. My black framed old faithfuls get a dab of black Texta from the son’s pencil case every two weeks or so… my 15 year old daughter is horrified that I could admit such a thing. Gasp! Pats for the cake bandit. Jacqui such candor is too be applauded. Here’s to home repairs and your resourcefulness. Boz says hi. Congratulation! You done good! Glasses look good, beard looks good! Well done! I finally got my specs from Zip. They’re wonderful. Don’t know why it takes me so long to get my glasses ordered after I go to the eye doctor…… (November) This pair is titanium and the frames weigh only 9 grams. With my photochromic progressive lenses, they weigh 16 grams. That’s about a half an ounce! Congrats on the new glasses Ann. I’m going to check out Zip, as I do need a back up pair. Nice patch up. Glasses like those are worth keeping around a few more years. Thanks Miss Renae, how’s life treating you these days? Those kids in college, yet? Like the fixed specs! I’m going to my local north end urban Ace and get myself some Plastic Surgery for my glue collection so next time I break the garage door remote I have something other than packaging tape and a cotton ball with which to fix it! As for the facial hair – nothing is nicer to behold than a good looking man with a good looking beard (I married such a guy). But a good looking man with a bad looking beard is… well… … rest assured that you fall into the former rather than the latter category! Thanks Margaret! A glue collection, eh? 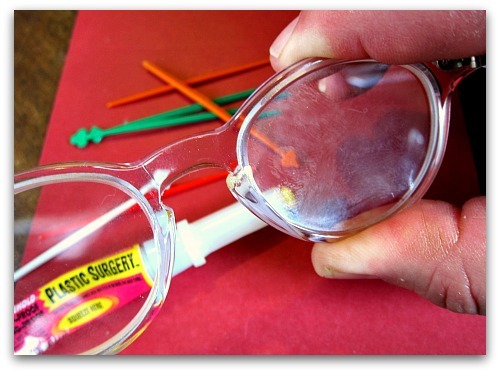 How awesome is that, and from what I can tell after a week or so, you can open and reuse the glue regularly. So far it hasn’t sealed up or dried out at the nozzle. How those bees coming along? Thanks Crystal, I’ll take distinguished and handsome any day! I think your friend’s saying is brilliant, says the man with several tarps on his barn. Yes, your old specs–now new again, thanks to Plastic Surgery–are the best! Love the name Plastic Surgery for that product … brilliant. 😉 Oh and the beard works nicely! Thanks Shirley, and what’s this I see about making Ding Dongs at home, hmmmm, and maybe some Susie Q’s? I love how previously everyone was telling you to lose the beard, and now in this one they’re asking you to keep it! hahaha. How does Boz and Gracie think of it? Thanks Donna for the vote of confidence. As for Boz and Gracie, they’re indifferent, I think. Sometimes they don their steely poker faces, and keep me guessing. 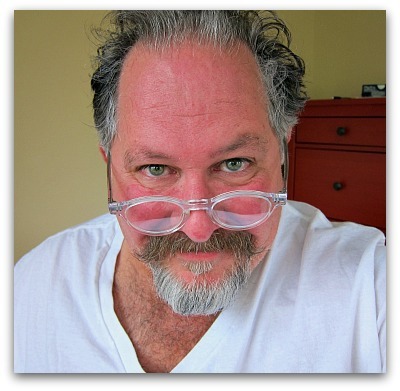 Bifocals… I have trifocals!! And I cannot wear progressive lenses. They make me so nauseous. I was thinking the glasses seemed the same too – and most certainly did not think you needed to change anything about your looks…just figured it was a post for others…but when I heard some of them talked to you, had to vote for you just being *you*. I mean heard “HOW” some of them….I need glasses. Have you ever heard of GlassesShop.com? That’s my favorite online glasses store. Stylish glasses, sunglasses, frames at a great price, all without leaving your house, easy and convenient.